On behalf of College, we would like to express our thanks to all who have supported our Golf Classic over the last number of years. The financial support which you have given to us provides much needed additional funding for the College Sports Fund so that it can continue to promote the participation of the college’s teams in many different sporting activities including rugby, hurling, Gaelic football, athletics, basketball and many more. This year the classic will take place at Castletroy Golf Club on Friday 18th of May 2018. The format is similar to previous years- a team of 4, 2 scores to count at each hole. Full handicap allowed up to Men 24 and Ladies 36. The cost is €300 per team of four which includes a meal after your round of golf. In addition to the normal team competition, a special trophy in memory of the late Joe Bourke will once again be presented to the best singles card on the day. In order to broaden the base of our support, perhaps you may be able to contact other past pupils with a view to entering a team together. In the event that you or your company are not able to participate in playing on the day, we would ask that you would please consider sponsoring a Tee or Green for €100. We would greatly appreciate your support. 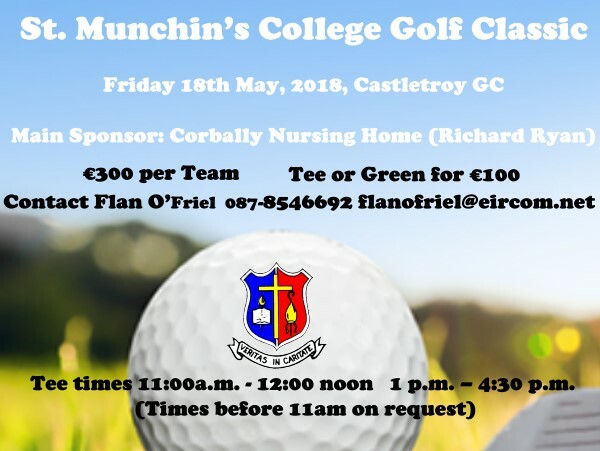 0 responses on "St Munchins College Golf Classic"